A Stirling Council worker has received national recognition for her efforts in bringing empty homes back into use after scooping a prestigious award. Empty Homes Officer, Allyson Allison, received the Outstanding Individual Special Mention accolade at the Howdens Scottish Empty Homes Champions of the Year Awards. Since 2013, Stirling Council have returned 278 empty homes, providing the authority with an extra £335,100 to run vital services. Along with wasting resources, problems associated with long-term empty homes include crime and anti-social behaviour. They also reduce the value of surrounding properties and can be an eyesore. 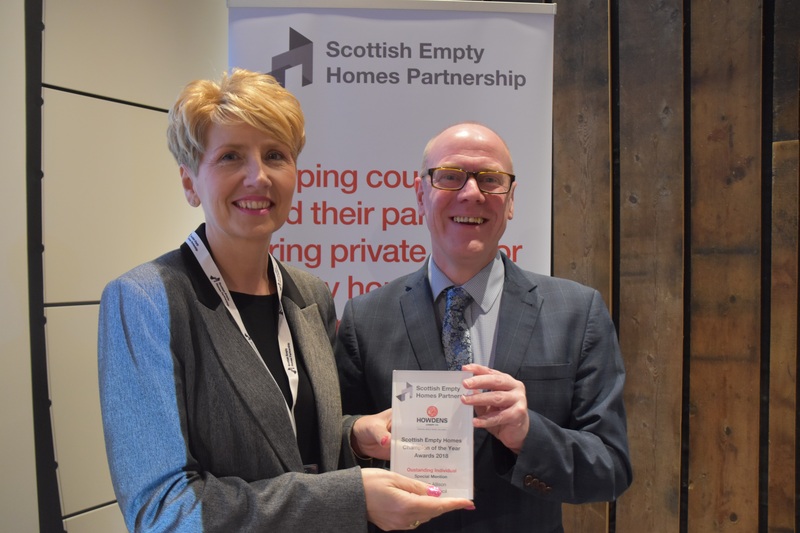 Allyson was presented with her prize at the Scottish Empty Homes Partnership annual conference which was held recently at the Engine Shed in Stirling. She said: “I’m absolutely delighted to receive this award in recognition of Stirling Council’s ongoing commitment to Empty Homes and to the national strategic objectives of bringing long term empty homes back into use and therefore contributing to the increase supply of homes. Councillor Evelyn Tweed, Housing Portfolio holder for Stirling Council said: “A huge congratulations to Allyson on collecting this award. This is another success story for the housing team as they tackle this important issue. “Empty homes have a damaging effect on our communities across Stirling and bringing them back into use provides a range of environmental, social and economic benefits." If you own an empty home and would like more information on bringing the property back into use please contact Allyson Allison, Empty Homes Officer, on 01786 23780. Note: Picture shows Stirling Council Empty Homes Officer, Allyson Allison, with her Outstanding Individual Special Mention Award, alongside Kevin Stewart, Minster for Local Government, Housing and Planning.